This view appears when application starts and contains shortcut buttons for main tools, wizards and recent activity shortcuts divided in groups for easy access to Active@ UNDELETE features at application start. 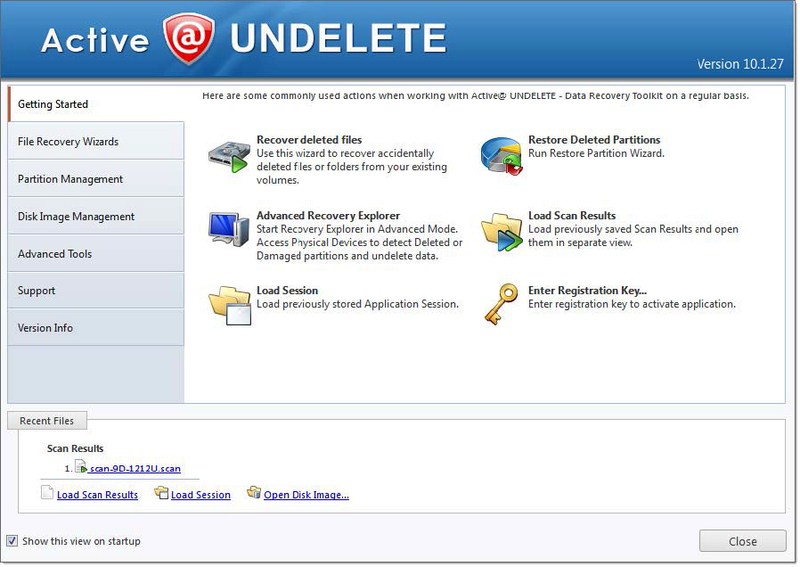 Contains most general starting points for file recovery and partition restoration. As it stated, on this page user can start file recovery wizards designed for different scenarios. Allows to open Partition Manager or start wizards to create or format partitions. Let to run wizards to create, open or verify disk images. Advanced tools like open disks in Disk Editor, create Virtual RAID or decrypt files. Contains version history and information about recent updates. Group of shortcut links to open recently used Disk Images, sessions or saved scan results.